Premiering at the Daytona 500 Toyota Pit Pass event, Toyota’s Baja simulator is the result of Toyota’s desire to exhibit the power and potential of the Toyota 4Runner. 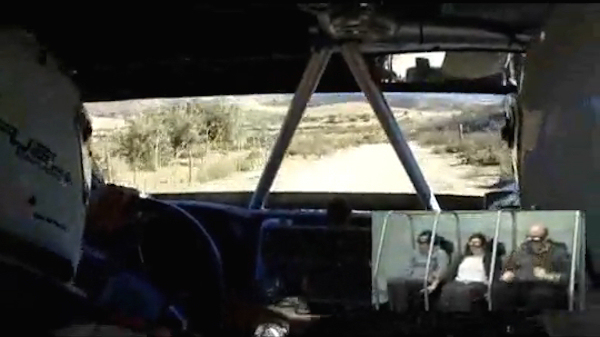 Participants will have a chance to sit in the three-seat state-of-the-art virtual reality simulator and experience an exhilarating, adventurous, driving experience through the eyes of the driver and helicopters while enduring the 672.85-mile drive down to Baja, Mexico. While participants are taking the thrilling ride demonstrating the endurance and stamina of the 4Runner they will be provided with heart pumping important safety information on the risks of distracted driving. Touted as a “Distracted driving, Education Program and Gaming Experience through first person virtual reality, the Baja Simulator is a futuristic medium featuring the ultimate driving experience via the virtual reality wide-screen personal head-mounted display system. It is the first system to physically move and lift occupants vertically and horizontally with precise acceleration of up to 2G’s and torque that simulates the race realistically. Users are viewing the actual footage of helmet cameras, helicopters and car mounted cameras that DTF motion coded to provide the most realistic ride possible. At the same time, clips of Toyota NASCAR drivers explaining the importance of being focused and alert about your surroundings and the road whenever behind the wheel are shown. From Daytona, the Baja Simulator will travel across the country to Toyota Pit Pass locations at NASCAR races or dealers to educate and excite consumers to test drive actual Toyota models and learn about road safety. See simulator in action at http://www.ctsmotion.com/.